If there is one word to describe the first six weeks of PDL Mid South results, it would certainly be unpredictable. We witnessed Texas United run off to an unbeaten streak and then get routed by Corpus Christi FC at home. FC Cleburne wins by 3 goals over Houston FC and then returns to the Gulf Coast two days later and loses to AHFC Royals by 4 goals. Last place Houston FC beat first place AHFC Royals last week. Through six weeks all teams are within one win of a playoff spot, though Houston FC face a tough hill to climb with two difficult home games and then a brutal road schedule to end the season. There is a divergence among all teams on the number of games played to this point (ranging from 4 to 7). As a result, it makes more sense to compare the standings on a points per game basis. Viewed from this perspective, the two teams who have played the least number of matches…OKC Energy U23 and Brazos Valley Cavalry FC would occupy the top two places and move on to the PDL Playoffs. There are still a number of games to go though and remember, unpredictable is the word. Week 7 will have a limited slate of only three matches, including the showdown between Brazos Valley and OKC Energy U23 in Bryan Saturday night. 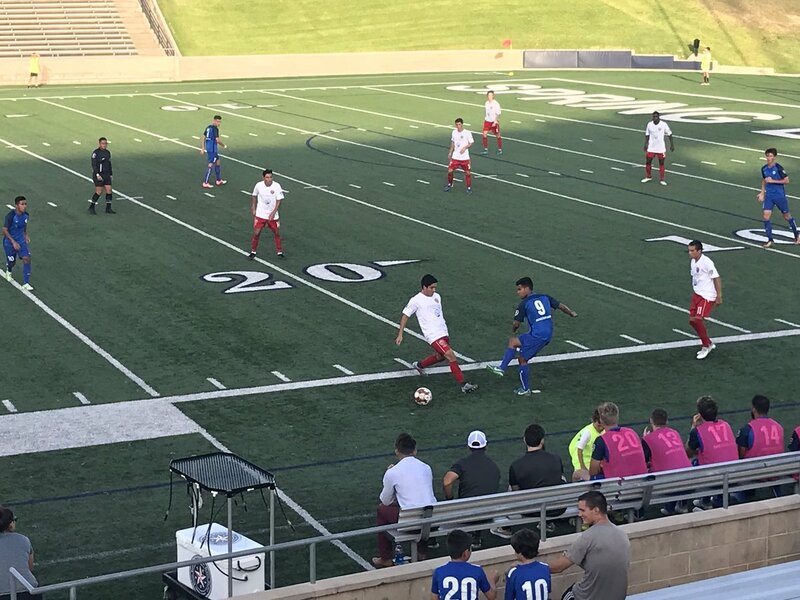 Corpus Christi FC achieved the most striking result of the Mid South season so far, when they traveled to North Texas and decisively defeated Texas United, a team that had not suffered a loss in their first four matches of the season. A hat-trick from Patricio Botello, scored after Texas United Jorge Barrientos had opened scoring in the 7th minute, did the majority of the damage for the Sharks. Additional goals by Ty Mobley and Adrian Villanueva completed the rout. A goal right before halftime by Jordan Simon and two second half goals from Aldo Tarantini (below) and Ben Davidson completed the Houston FC home comeback to defeat local rivals AHFC Royals 3-2. Royals forward Killian Colombie (first goal below) had put the Royals up two goals when he scored in the 6th and 25th minute. Did we just spy a Goal of the Week candidate from @houstonfcpdl's Aldo Tarantini? Three days after the big comeback over AHFC Royals, FC Houston was shutout at home 3-0 by FC Cleburne. A first half goal from Tim Ugo and two second half goals from Hikaruhito Meike and Tinashe Chigede, in stoppage time, were the difference. Cleburne goalkeeper Edward Pacheco, who was nominated for PDL national Save of the Week last week, stopped another second free kick and made three other saves to earn the shutout. Two goals from Houston Dynamo Academy products Thomas Menke and Heriberto “Beto” Soto led the Cavalry to a decisive 4-2 victory over Corpus Christi FC. Soto, who is 17 years old and plays for the Dynamo U-19’s was making his first PDL appearance of the year. Corpus Christ defender Ty Mobley was red carded in the 78th minute and then Soto scored his second 7 minutes later to put the game out of reach, though substitute Ignacio Dicun scored a late goal to narrow the margin of victory for the home side. Texas PDL travel can be brutal and FC Cleburne experienced this reality on Sunday night. Two days after beating FC Houston on the road, Cleburne made the return trip back to Houston, this time to face AHFC Royals. The results weren’t as positive, as four goals from the Royals in the first 15 minutes of the first half sealed what ended up being a 4-0 win for AHFC Royals. Two goals by Luis Sanchez and goals from Ali Kromah and Killian Colombie created the early rout that FC Cleburne was unable to overcome. The PDL schedules a handful of games between Divisions (and in this case Conferences) based on a number of factors. To balance the Mid South schedule, Energy U23 are playing two matches against Topeka-based Kaw Valley, an affiliate of MLS side Sporting Kansas City. The first was played in Kansas where OKC rode a hat-trick from Matt Puig and a single goal from substitute Llewellyn Evans to a decisive victory on Sunday. Kaw Valley will visit Oklahoma City for the return fixture with Energy U23 on June 26.